Len Berg’s Restaurant was an institution in Macon, Georgia, for almost a century. In later years, when owner Jeff Amerson ordered the annual billboard that simply said, “H.M.F.P.I.C. You Know Where,” customers knew. They knew where to find “home made fresh peach ice cream” on June 1. Throughout the year, they knew where to find black-eyed peas, salmon croquettes, turnip greens, cornbread, lemon meringue pie, and more. They knew where to find classic Southern food that was good for the soul. Thirty beloved recipes appear in this text, but Remembering Len Berg’s Restaurant is more about the place and about the people who kept the establishment a favorite destination for good food for almost 100 years. Leonard Berg, son of a German Jewish immigrant, created a restaurant in the early part of the twentieth century at a time when public dining served the needs of weary travelers. 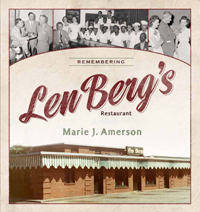 Berg adapted and grew his business as the industry evolved, and by the time he sold it to Arthur Barry in 1943, Len Berg’s Restaurant was a well-known part of the Macon community serving lunch and dinner to businessmen, families, and travelers. From his earliest days as a restaurateur, Arthur Barry employed a young Jeff Amerson, the man who took over as proprietor in 1969. Amerson, and then his son Jerry, ushered the iconic Southern restaurant into the twenty-first century before passing the torch to new owners. Years after the Amerson family sold Len Berg’s Restaurant, and years after it closed, former patrons still recall favorites from the menu and express a fondness for the sweet tastes of a place in memory. Like a tall, cool glass of sweet iced tea or a “little bit” of H.M.F.P.I.C., Remembering Len Berg’s Restaurant will help satisfy their hunger for a piece of Macon history.